ummmm hi! I think this is my first post here, be nice to me. I was in Barcelona last week (I know, my life is cooler than yours) and I went to see the babies play! 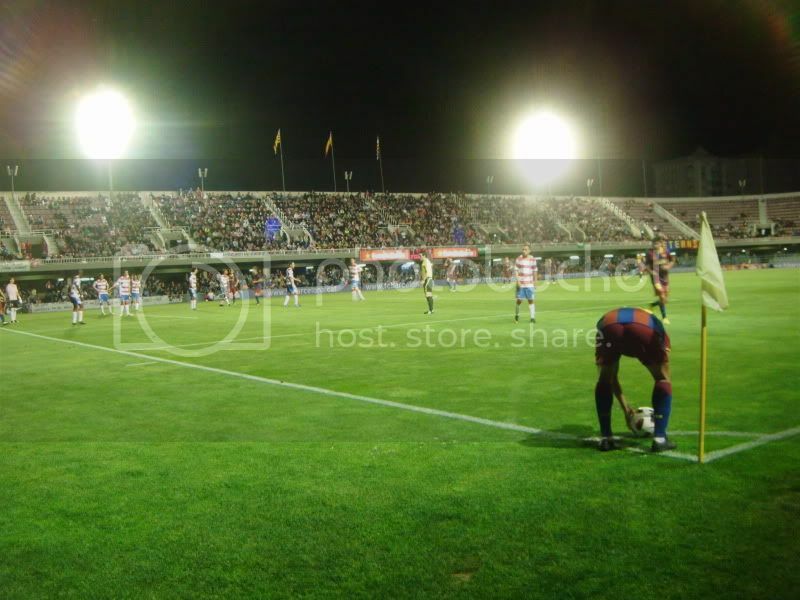 (btw if you are ever in Barcelona and the B team is playing at the Miniestadi, GO, the tickets are only 8-15 euros and the bbs need your support too!) my comprehension of what went on was pretty limited since (a) it was my first live match and (b) I was sitting on the lower level in the corner and thus could only see about a quarter of the pitch, but I will attempt to contextualize my pictures as best I can. but first, a picture which requires no context at all. Most importantly: Barca are safely through to the CL group stages. The consequences of failure, both financial and sporting, would have been severe. I don't know about you guys, but I was pretty damn terrified at the beginning of the pre-season about qualification. New coach, new players and the boardroom a mess? Yeah. The powers that be were too, which is why they initially fought so hard to keep Messi. But the pre-season was great, and things went okay without Leo, which is nice. Also, before I forget: a very happy 18th birthday to Bojan Krkic for tomorrow! First of all, massive apologies for how late this is. So Barca played their first official game of the season, a crucial Champions League qualifier against the Polish champions Wisla Krakow, and did pretty damn well. Full match report and lots of photos beneath the cut. For those of you who saw the game: what did you think? Did it make you more optimistic for the season ahead? How about the new players, what did you think of them? 0ntheverge has already kindly taken care of the rest [go to her post for goal videos, pics, and such], so I'll just be providing my rambling match report. You'll have to excuse me if I'm even less eloquent than usual - my head feels like it's about to explode, so. In other news, the draw for the Champions League qualifiers has been made, and Barca have been handed a decent draw, although I'm sure the away leg will be a difficult test. Barca will play the winners of the tie between Beitar Jerusalem FC (Israel) and Wisla Krakow (Poland). The first leg will be on the 12th or 13th of Augst, and the return will be on the 26th or 27th. I apologize for my lack of activity in the community lately. Line-up: Valdés, Alves, Puyol, Piqué, Abidal, Xavi, Touré, Iniesta, Pedrito, Keita and Messi. Barcelona are currently in Chicago and will be playing Chivas de Guadalajara August 3rd. Then they head to NY to play the Red Bulls on August 6th, which I'll be attending. =) Anyone else attending one of these games?